It's blueberry season now in Australia and I want to bake blueberry muffins!!! I love blueberry muffins especially those that are moist and fully loaded with blueberries! Do you? Ahem... And I can be very FUSSY with all the blueberry muffin recipes that I like because I do know the ideal kind of blueberry muffins that I'm after. And this Famous Jordan Marsh Blueberry recipe is the next one in my list! 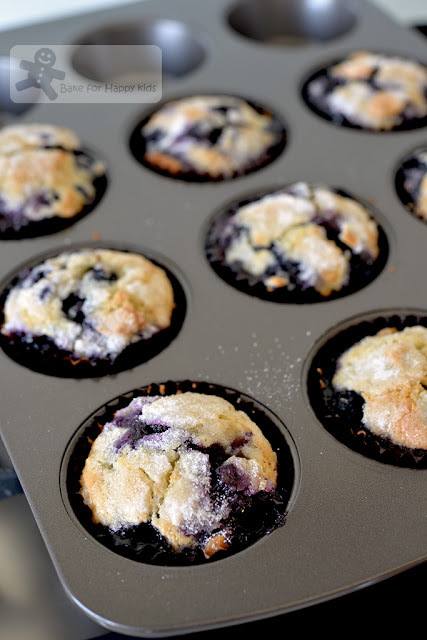 Have you tried baking these "Famous Jordan Marsh Department Store" Blueberry Muffins? 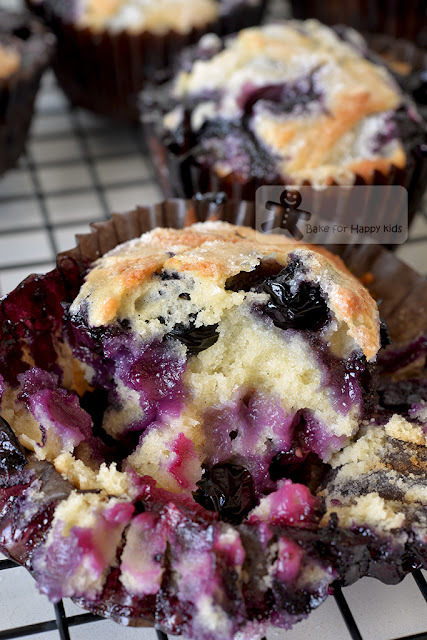 These muffins are so fully packed with blueberries!!! They must be famous for a reason! The Famous Jordan Marsh Department Store Blueberry Muffins? Being a Gen X Singaporean who lives in Australia, I have never heard of Jordan Marsh Department Store before I baked these muffins. According to Wikipedia, Jordan Marsh was an American department store chain that was operated throughout New England. It is now permanently closed and some of its stores were converted into Macy's in 1996. Accordingly to the recipe at NY Times, there was an article about this famous blueberry muffins recipe, saying that it originates from the closed Jordan Marsh department store instead of Ritz-Carlton. Thus, many American recipe websites at here, here, here and here called this recipe "The Famous Jordan Marsh Department Store Blueberry Muffins". I have been eyeing to bake this highly reviewed recipe for a looooooong time. 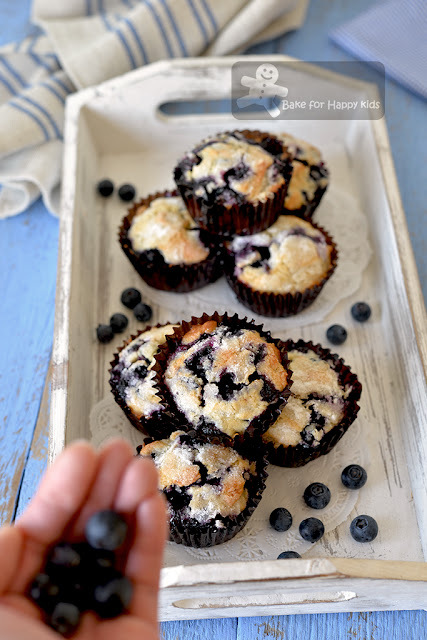 Since it is Australian blueberry season now, I know that it is a great opportunity to bake these muffins! And I'm so happy that I did! Each of these standard 1/3 cup blueberries muffins is packed with more than 20g fresh blueberries. This is why every bite of these muffins is exploding with blueberries!!! Are these blueberry muffins "The Famous Jordan Marsh Department Store" or not? Some recipes insist that we should stick to the recipe to the tee in order to enjoy the real taste of "The Famous Jordan Marsh Department Store Blueberry Muffins"!!! 1) use coarse white sugar to sprinkle on the top of the muffins! Yes... I must use caster sugar!!! 2) reduce the amount of sugar added into the muffin batter! 3) reduce the amount of sugar sprinkle on the top of the muffins! Yes... I have to agree with this! The generous sugar coating on the muffin tops is one of the reasons why the muffins taste so inviting! 4) reduce the amount of blueberries added! Yes... This is absolutely TRUE!!! According to this recipe, you can substitute fresh blueberries with frozen ones and you don't have to crush any of them. Rinse frozen berries several times in cold water, then pat dry with paper towels before using. This will prevent the muffins from being blue-green. Another good thing about this recipe is it is very easy to bake!!! Watch my video and you probably want to bake some muffins for yourself now!!! Please note the ingredients used in my video is half the amount listed in the following recipe. Having said that, I won't be sharing any recipes for the next 2 weeks because my family and I are going back to Singapore for a short break. Here's the HIGHLY HIGHLY HIGHLY RECOMMENDED recipe that is adapted from NY Times, Epicurious, King Arthur Flour and Food Network. The crazy me actually stared at these recipes to detect the similarities and differences! I see that all recipes except for the NY time's one are close to 95% similar. Unlike the rest, the NY time's recipe has 1/4 cup lesser added blueberries and 2 tbsp more sugar added into 6 muffins but less sugar sprinkle on the muffin tops. Hence, mine is mostly like the ones at Epicurious, King Arthur Flour and Food Network. * If you are using frozen blueberries, do not mash any of them. Rinse in cold water several times, then pat dry with paper towels before using. This will prevent the muffins from being blue-green. 50g (1/4 cup) caster sugar - do not reduce this amount! Preheat oven to 190°C / 375°F. Grease or line muffin pan with 18 standard 1/3 cup capacity or 12 standard 1/2 cup capacity. Using a wooden spoon or an electric mixer with paddle attachment, beat butter and sugar for about 2-3 mins until combined and fluffy. Add eggs and vanilla and beat until combined. Use to a fork to mash 3/4 cup (100g) blueberries roughly and mix into the butter mixture. Combine flour, baking powder and salt. Sift half of the flour mixture into the butter mixture and mix until just combined. Mix in half of the milk. Sift in the remaining flour mixture. Add the remaining milk and mix until just combined. Fold in the remaining 1 3/4 cup blueberries (275g) gently until incorporated. Divide mixture and fill each muffin cup to 3/4 full. Divide and sprinkle all of the topping sugar over muffins and bake for 25-30 mins (25 mins for 1/3 cup muffins and 30 mins for 1/2 cup muffins) or until golden brown and well-risen. Allow muffins to cool in the pan for about 10 mins before transferring them onto a wire rack to cool completely. Enjoy while they are warm and completely cooled. It is easier to peel off the paper liner when the muffins are completely cooled. Store any leftover in an airtight container at room temperature for up to 3 days. I prefer not because these muffins taste the best when they are baked with un-cooked blueberries and the blueberries in a can had been cooked! I am from Singapore. Love all your chiffon cake recipes which got me started in baking. For this recipe, as I am lactose intolerant, can butter be substituted with oil, and if ok, the measurement equivalent please? Hi Anne, I'm sorry that I have not tried baking these muffins with oil before and can't tell what amount I can substitute. Cheers!